Hope you had a nice Easter yesterday. I was blessed to spend the afternoon with good friends. Actually, next Sunday is my Easter, so I have some extra time to get those Easter cards in the mail to my family. Today, I wanted to show you two different cards I completed using this pretty dragonfly stamp from Outlines. Michael Strong showed me this pretty layout and color scheme when we were in Boston. You know I love the white on white; it's very simple, yet elegant. To give the dragonfly a pretty shimmery and pearlized look, I rubbed Viva Decor Inka-Gold creme (in platinum) over it. The little diamond shaped tiles is another trick I learned from Michael Strong...........it is double sided foam tape heated with embossing powder! 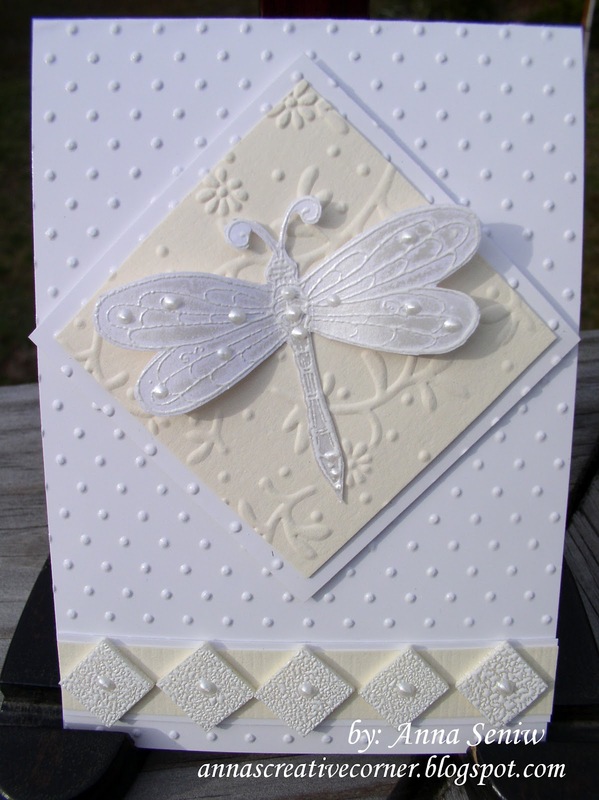 To finish off the card, I added the pearls with the Viva Decor Pearl Pen. 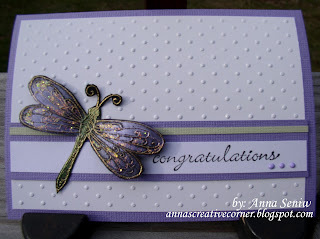 For this card I used the same dragonfly stamp but this time I wanted to use some color. I used Viva Decor Inka-Gold creams over the dragonfly, but in lilac and yellow green and added stickles for even more sparkle. If you would like to create these two cards and get to play with the Inka-Gold, join us for a quick class on Saturday. You asked for shorter classes; we are going to try it with this one! Call and reserve your seat today. The fee is only $8 and you will be done in about an hour. These are both very beautiful. Thank you for sharing the details. You're a Classic Type of Girl!